Google Mobile Interstitial Penalty coming January 10 ‘17. Last week, Google announced that it would be creating a search penalty for sites using pop-ups and interstitial ads on their mobile sites. This penalty will replace and strengthen the previous app interstitials ad penalty. But, not all app interstitials will be penalized. Only those that interfere with the content of the site. Ads only using a reasonable amount of banner space are fine. Exception is also given for interstitials for cookie usage warnings and age. Expect the penalty to go live on January 10, 2017. Google Popup & Interstitial penalty applied to page level. Google’s John Mueller confirmed on Twitter that Google’s upcoming penalty on obtrusive popup and interstitial ads will be applied to pages rather than whole websites. This is similar to how Google’s mobile-friendly penalty was applied. Google index status report fixed. For a number of weeks the index status report within the Google Search Console was broken. However, John Mueller said that the report has been fixed and is catching up processing data. 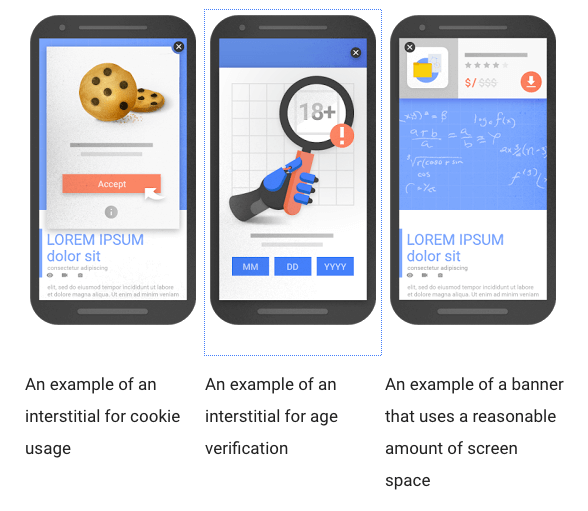 Google not planning on creating mobile interstitial testing tool. 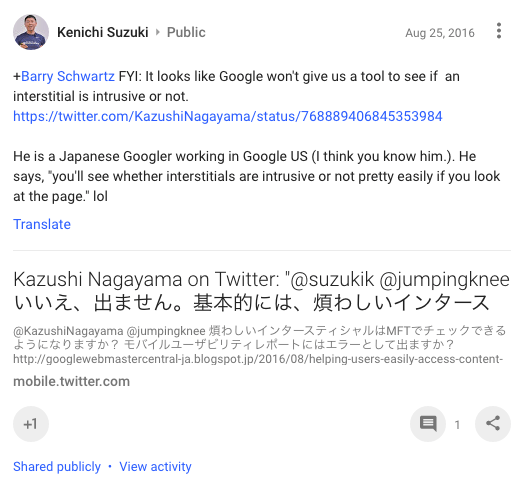 Kenichi Suzuki asked (via twitter) Google’s Kazushi Nagayama if Google would be adding such a tool to the Google Search Console or mobile usability reports. It turns out that the answer is no. AMP is supporting an <amp-experiment> which allows publishers to test variation of their pages. Multiple variants can be included in each test. The AMP Project has provided full documentation as well as a demo. 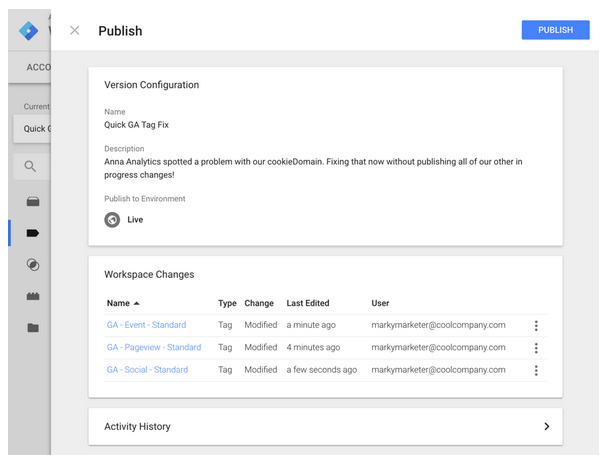 Google Analytics releases Workspaces for tag management. Google Analytics is rebranding itself as Google Analytics Solutions and launched a new feature called Workspaces. Workspaces is a collaborative feature found in Google Tag Manager and Tag Manger 360. Workspaces allows multiple teammates to work on tags at the same time, making quick changes without publishing everything. The Workspace is a place to work and set changes to new versions of tag management. When a new version of the workspace is published the list of changes is carried over to the new version, keeping a full history of what has been changed. Bing search app for iOS & Android adds new features. Bing rolled out new updates to its search app for iOS and Android. Version 6.7.2 of their app includes the ability to play a video without sound in the search results as well as a new Music page that lists trending songs and artists. The app will also tell users the name of a song that is playing. Users can add movie titles to their Netflix and prime watch lists from the app’s Movies page. Read Bing’s announcement for all the details. Bing test replacing URLs with brand name in search results. Bing is running an odd test, where it is replacing the URL in a search result with the company brand name. The test was spotted by Frank Sandtmann. Isolated test shows that click-through rate does impact search rankings. Columnist Brian Patterson ran a test on one of the test website that he maintains. In a small, isolated test of nine keywords he found that click-through rate did impact his search rankings. CTR impacting search ranking is something Google has consistently denied in the past. Of course this was a limited test and cannot be extrapolated to all search results. Probably no more Panda update confirmations from Google. In a recent Google+ Hangout, John Mueller answered a couple questions regarding Panda. First, he explained that although Panda took 10 months to roll out completely in this latest update, future roll outs will not necessarily take that long. Mueller also commented that Panda would continue to be on a gradual roll-out so there probably would be no spike to indicate an update. It seems unlikely that Google will confirm future updates as no one will be able to call them out on a roll-out. Requiring a followed link for API access is same thing as a paid link. John Mueller responded to a question on Twitter by Jordan Silton. 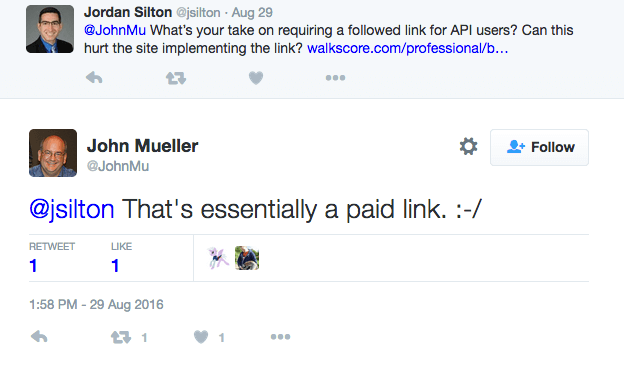 Mueller explained that requiring a link to a site in return for API access is essentially the same thing as a paid link. This same reasoning could also be applied to any other exchange of value for a link, making many common-practice techniques grey-hat. Bing opens Expanded Text Ads to all customers. Standard text ads have a 25-character Ad Title, a 71-character Ad text, and a 350 character display URL manually entered. The new ad format includes a 60-character (two 30-character ad title separated by hyphen), 80-character ad text and a display URL automatically generated from the final URL, preserving capitalization and two customizable URL paths. The new expanded text-ads are available to all interested advertisers. Advertisers can apply for use of Expanded Text Ads here. Google Adsense drops ad limit per page. Google removed the language in their help thread that restricted ads per page to three Adsense content units. The policy has been updated to title the section ‘valuable inventory’. Site owners are cautioned to not let the amount of ads on a page exceed the actual content. Failing to follow the guideline could result in Google limiting or disabling ads. The change should hopefully improve content quality and suppress cheating webmasters…some had been breaking content into multiple page slidehows to allow for more ads. Bing Ads allows separate ads for search and MSN.com native ads. Bing Ads Editor now supports custom ad development for native. Advertisers can create separate ads in bulk, specifically for native inventory on MSN.com. Distinct native ad copy is already supported within the Bing Ads web interface. Separate native ads will only be served when there is at least one search ad in the ad group. Google does not rank expanded text ads over standard text ads. 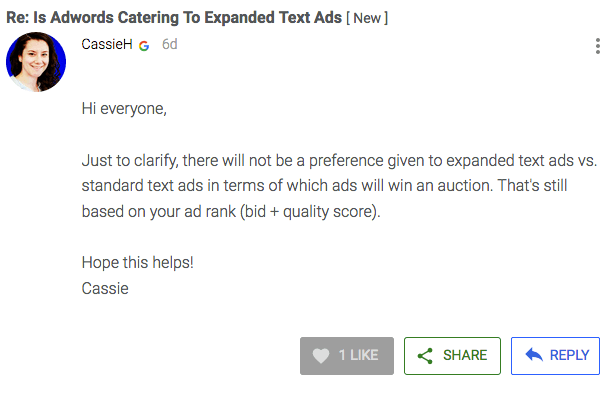 Cassie from Google, noted in a Google forum that no preference is given to expanded text ads over standard text ads. The order is based on ad rank (bid + quality score). Google’s upcoming popup/interstitial penalty affects AdSense Page-level Ads? John Mueller provided a vague answer to a question posed to him on Twitter. He was asked how Google’s upcoming penalty against popup and interstitial ads will apply to Google page-level ads. Mueller responded that Google was interested in how the ad affected the customer experience, no matter where the ad came from. However, it is very unlikely that Google would attack its own ads. We will have to see how it is applied upon release. 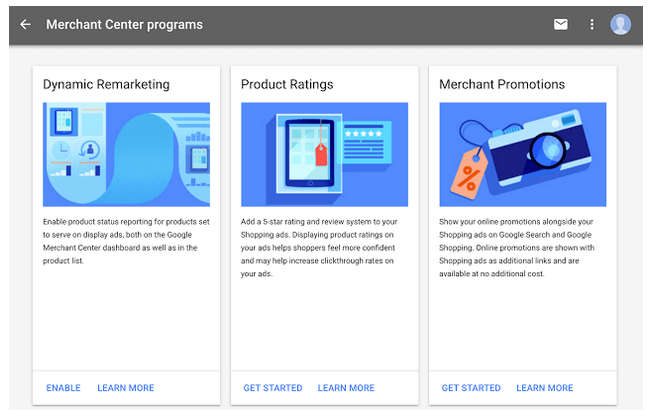 Google launches new look for Merchant Center. Google has released a new interface in the Merchant Center, built using Google’s Material Design. This is the same design used in many Google products, including the new Adwords interface. Product tabs and other topics are found along the left side of the page. The data in the diagnostics page is now updated near real time, instead of twice daily. The biggest change is that the new Feed Rules allow you to make changes to the feed without having to edit it directly. For a full list of updates, read Google’s announcement. Amazon rolls out Vehicles, an online store for car shoppers. Amazon has launched Amazon Vehicles. Vehicles is not a place to purchase cars, but it is a research destination for people starting the car buying process. Users can access images, videos, customer reviews and a forum for car enthusiasts to ask each other questions. Not only is Vehicles a direct competitor to sites like cars.com and Edmunds.com but it may become a new starting search destination for vehicles, rather than Google. Google updates Google Schema review guidelines. Google has updated its guidelines for use of review rich snippets on websites. There are several changes to the guidelines, one of the largest is that webmasters are not allowed to markup reviews from third-party sites. Reviews must be produced directly from the website. Webmasters are also required to allow customers to post negative and positive reviews. You can read all of the updates in Google’s help doc. Google increasing number of reviews required to display Seller Ratings in ads. Though not official, Google has told some customers that the new minimum for Seller Rating extensions to display in Adwords ads has been increased from 30 in the past 12 months, to 150. Other rules remain the same, including the composite rating requirement of at least 3.5 stars and the requirement that at least 10 reviews need to be in the users’ Google interface language. If this becomes an official policy it will make it much more difficult for small businesses. Other internet companies support Yelp in case regarding reviews. Dawn Hassel is a San Francisco lawyer who sued individual who had written a negative review on Yelp. Hassel sued for defamation and won the case, which resulted in the Judge ordering Yelp to remove the review. Yelp is refusing, stating that it was not involved in the case and denied due process. If the case is not overturned, it could set a terrible precedent where businesses can bully and threaten negative reviewers with lawsuits. Several companies, including Google, Facebook, Pinterest and Twitter are supporting Yelp and have submitted letters to the California Supreme court, urging it to overturn the case. Google updates local 3-pack design. Google made some subtle changes to the 3-pack design. The color is a bit lighter and the position of the website icon has been shifted to the right. Here is an example of the before and after. Google My Businesses adds Accept or Discard Updates. Google My Business has added the ability to accept or discard updates for individual fields in bulk. Their help document notes the steps to do so. Google Home Services testing Mobile Carousel Layout. Google has been testing home service ads in the greater San Francisco area for months now. The ads display local, Google-vetted contractors on the top of search results in place of the local three-pack. 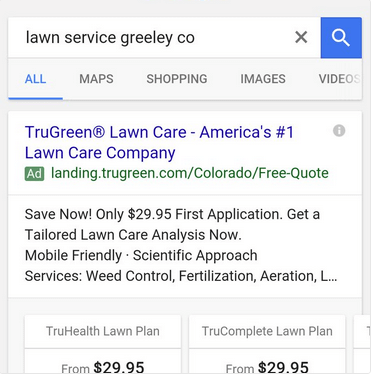 Google has recently been testing a carousel format in their homer service ads. This was spotted by Lee L Kennedy. Google continues to crowd source Local Business data. A few months back, Google began asking users of the local three-pack to verify information about local businesses. They have expanded this crowd sourcing effort by asking users to tag businesses with related topics. Specifically they ask for users to tag the business under three categories: Offerings, Planning, and Highlights. Imgur announces new ad unit: promoted posts. Imgur, a social site for images and GIFs, has 150 million monthly users and is adding a new ad unit, promoted posts. Promoted posts, target mobile viewers and are inserted into users’ content streams. The ad can include video that plays in posts. The posts intentionally come without data targeting. But, targeting is probably unnecessary as Imgur is already centered around a target segment, male, millennial geeks. the place to go for Imgurians, male geeks. Imgur is boasting engagement rates of 20% for the new ad format. Youtube working on new Backstage feature. Youtube is attempting to make itself more of a social media platform with introduction of Backstage. Users will be able to share more with their subscribes including: photos, polls, links, text posts and exclusive videos. Backstage will first roll out to a few popular YouTube accounts and then to the general public. No exact date for release is set, but expect it to come out later this year. LinkedIn rolling out conversion tracking. Linked has begun rolling out conversion tracking (using the Linkedin pixel) to select advertisers and hopes for a 100% rollout by the end of August. This is hopefully the first of many steps to improve the frustrating LinkedIn advertising experience. Facebook displaying vertical videos in mobile news feeds. Facebook previously cropped vertical videos into squares when displayed in news feeds. Now, vertically formatted videos, including ads will appear in vertical format for iOS and Android users’ news feeds. The change cements the format’s popularity but was also done because Facebook found that users were watching more vertical video and watching with the sound on. Instagram videos becoming longer and more common. Sensor Tower released its Q2 “Ad Intelligence Data Digest.” Their report reviews mobile advertising trends on social media sites. The report found one of every four ads on Instagram is a video ad and there has been a stronger push on mobile video ads. 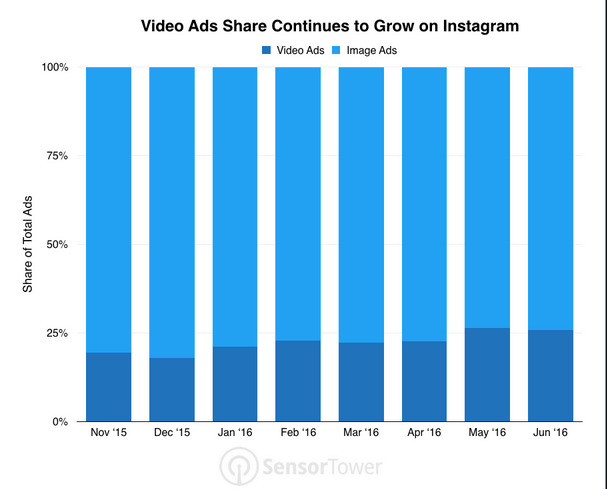 The average duration of video ads on Instagram has increased from 15 seconds in January 2016 to 25 seconds in June. The ads displayed on Instagram are a mix of games, shopping and entertainment. Twitter adds button for direct messaging business. Twitter has released a new feature that lets people contact businesses through direct messaging. This feature seems to be a response to Facebook’s similar use of Messenger. Snapchat to reach 217M users by end of 2017. Snapchat now claims 150M users and is expected to grow by 27.2 percent during 2016 and 13.6 percent the following year. This will bring the total user base to 217M users by the end of 2017. This growth will help Snapchat continue to attract big advertising dollars. Facebook adding text and music to its slideshow ads. Facebook has updated its slideshow ads to allow marketers to create multimedia ads directly from the Facebook mobile app. The latest version of the ad allows for up to 10 photos, as well as text and music. Facebook is currently only offering their own themed music, but soon brands will be able to upload their own tunes. Facebook claims that the new format has improved click through rates and cost per acquisition for both small and large businesses. Google Allo receiving good reviews even before release. Google’s Allo is a messaging app, tied to phone numbers, which connects Google Assistant into user’s chat with friends. Users can also chat with the Google assistant one-on-one. Google Allo is only in private testing by direct invite but already has 4.8/5.0 average rating (66 reviews) in the Google Play Store. LinkedIn adds new content search feature. 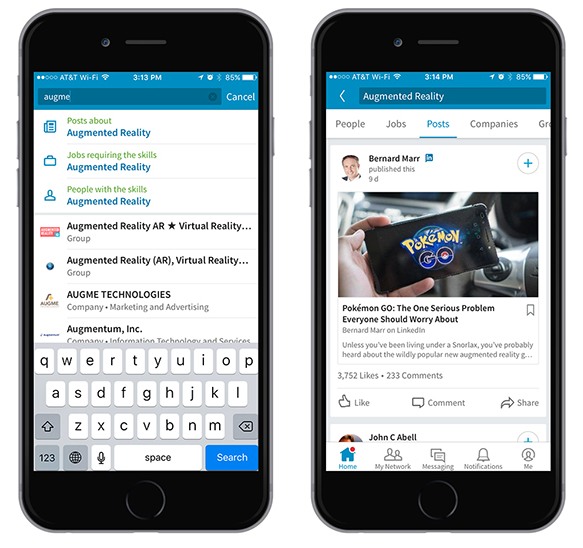 LinkedIn has added a feature that allows users to search for any topic and find relevant articles on LinkedIn, created by third-parties or by other members in the feed. This feature will allow users to search their feed, explore topics, and tap hashtags included in posts. LinkedIn ProFinder is a platform for businesses and consumers to find freelance professionals in Design, Writing and Editing, Accounting, Real Estate and Career Coaching. ProFinder is being made available in all (and only) the US but already boasts 50,000 freelancers across more than 140 service areas. Users can get started by submitting a project request. Facebook introduces Lifestage, a stand-alone app for high schoolers. Lifestage allows users to build a profile entirely of “video fields” and share them with their school community. The feature is about expressing who you are but now in the form of videos, instead of solely images. Youtube rolls out a new TV app. Youtube has updated its TV application to make its experience easier to use on the big screen. The new version will have a different look and improved categories that better fit the user experience on the television. The new category setup makes it easier for users to easily get to the most popular videos. Even on TV, Youtube is still focused on short-form content rather than longer viewing experiences traditionally associated with telvision. 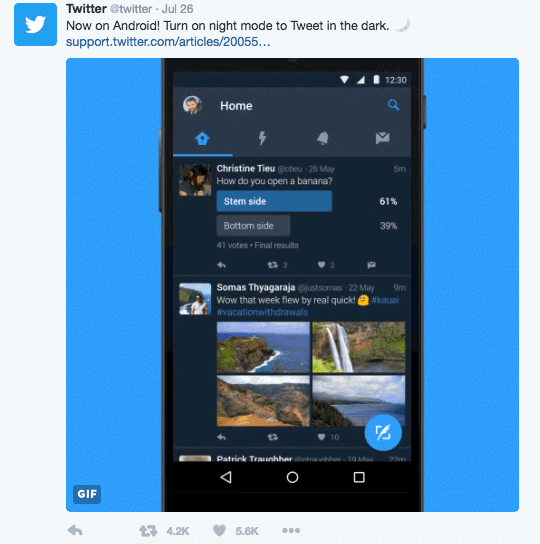 Youtube has added an update for Android users that adds a dark ‘night mode’ to make it easier for users to tweet in the dark. Facebook removes story descriptions and adds number of mentions. Facebook has updated Trending topics, removing the story descriptions that were listed alongside the topics. Instead a “simplified” topic and its number of mentions are posted. Trending Topics are run using an algorithm, based on a user’s activity (page likes, location and previous trending topic interacted with). Facebook using the data from WhatsApp. Snapchat pushing brands to shorten their ads. With users quickly skipping video ads, Snapchat is now pushing for advertisers to cut their 10-second ads to 7-seconds when running between Stories and down to 5-seconds when running within Live stories. These limits are recommendations and not requirements. While advertisers are annoyed at the prospect of retooling their ad campaigns, the shorter formats may result in better engagement and increased conversions. Study says Youtube and Linear TV help each other. A Nielsen case study commissioned by Google (take it with a grain of salt) found that TV reach drives YouTube engagement and vice versa. This is the opposite of the popular view that Youtube and TV steal from each other’s audiences. When shows have a presence on both mediums a rise is seen in both mediums as audiences are drawn back and forth. However, such mutualism is not always the case, especially as digital giants like Time Warner Cable pushback against Youtube’s efforts. Facebook adjusts the button placement of live video for mobile. Facebook has moved the live video button in its mobile app to a much more accessible spot on the top left of the page, where the “Status” used to appear. Users who click the button are brought to a video camera where they can start livestreaming by clicking “Go Live”. This is part of Facebook’s continued attempt to get in on the rise of livestreaming. Snapchat bringing live scores to high school football games. Snapchat has signed a deal with ScoreStream and this fall will start to power real-time geofilters for high school football games in the U.S. The partnership with ScoreStream is the first time that real-time scores will including advertising. Gatorade will be a sponsor of the program this fall. Facebook allows users to save offers in new Offers tab. Facebook’s coupon product, Offers, is getting additional attention. Offers was first created in 2012 to allow brands to distribute coupons on Facebook. The product has been updated to make it easier for people to see, save and use coupons. Coupons can be saved in a new offers tab and alerts are sent to the user when coupons near expiration. To use the coupons, users can pull them up in the offers tab and stores can scan the bar code provided. Twitter offering better revenue deal for creators. To attract more advertisers to its platform, Twitter has extended its video ad program to individual video creators, allowing them to make money off their videos. Twitter will place ads alongside or in front of videos and offer a share of the revenue. Youtube and Facebook currently offer 55% of revenue to creators but Twitter will offer 70%. Even with the higher percentage, creators may not make much money because Twitter is being pressured by advertisers to lower its video ad rates. EU requiring 14.5B in taxes from Apple. The European Commission (EC) announced that Apple owed over $14 billion dollars in back taxes. The EC asserted that the Irish government showed tax favoritism to Apple. The favoritism came in the form of a one percent tax rate for Apple. The EC’s actions are part of a larger effort to crack down on individual governments using aggressive tax policies. Facebook Ads Manager down last week. Last week a number of marketers could not access their ad information because the Facebook Ad manager was down. The system is currently back up and running. Stay informed of the latest search engine optimization, pay-per-click advertising, local search and social media marketing news. I read all of the industry news sites so you don’t have to. 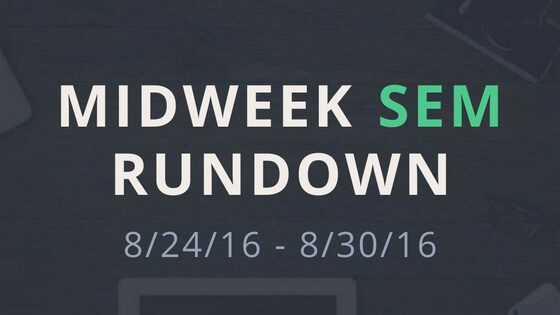 Instead get the major SEM news of the past week straight to your inbox.